Getting away from busy tourists popular attractions. deep yourselves in the beauty of primitive nature in the remote region near Chinese border, paying visit to tribal villages, making acquaintance with local peoples from ethnic minority groups including the Flower H’mong, Black Zao, Pa Zi, Tou Zi, Bo Y and joining them at the Pha Long Market for the significant event of the week. Please, be ready at your hotel lobby at 20.00 for a short transfer to Hanoi railways station for taking the overnight train (first class 4 beds cabin with air-condition) which arrive in Lao Cai city, near the Chinese border next morning. Meet your local guide and driver at Lao Cai Station upon your arrival, freshen up and enjoy Breakfast before heading north overland 55km to Muong Khuong and turn right for 25km along the Chinese border line to Pha Long Market. This very rural market is not very famous among tourists because of poor transportation and special government permission but really fascinating one for its special festive atmosphere. 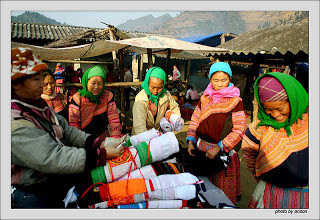 Joining local tribal peoples you will spend some hours at the market place where all local products and farming tools as well as Chinese cheap consumer goods can be seen for sales. 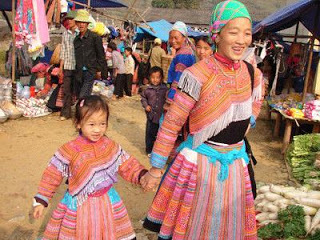 But more than that, you can see and even contact friendly and cheerful minority peoples of different tribal groups in their colorful traditional dresses who come from remote villages mainly for enjoying meeting others for socializing. After the market, we shall drive back to Muong Khuong for Lunch and continue along the country road along the Chay River and later arrive in Cao Son village which nested in the green color of the mountains, forest and rice paddies. Check in the Eco Lodge and enjoy for free time to discover the beautiful surrounding nature. Today plan is for walking to explore tribal villages around Cao Son. From the Eco Lodge you will follow quiet village foot path up and down hill through valley and plump fruit gardens passing some villages of the Nung and later to Lung Sen a large village of the Flower H'mong which featured with spacious houses built with earthen walled. After many home visiting you will enjoy Lunch in the village. The walk continue in the afternoon for few hours passing a beautifully green valley of rice and corn fields to visit Seo Lung Cheng village. Getting to Lao Cai Station at about 17.00, taking shower and dinner on your own before boarding the overnight train to Hanoi. You arrive in Hanoi train station around 05.00am. Tour finishes. • Accommodation: 1 nights at the Cao Son Eco Lodge. • Visiting fee, tax and service charge. • Meals not indicated in day by day itinerary.